Gold prices on Friday plunged by Rs 330 to Rs 31,420 per 10 grams in the national capital on lower sales by retailers and jewellers at current high levels. Silver also eased by Rs 100 to Rs 51,800 per kg on lack of buying support from industrial units and coin makers. Traders said reduced offtake by retailers and jewellery fabricators at existing higher levels mainly kept pressure on the prices of both the precious metals. rising equity markets further influenced the market sentiment. 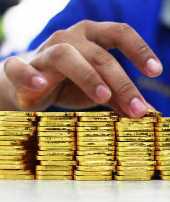 Gold of 99.9 and 99.5 per cent purity plunged by Rs 330 each to Rs 31,420 and Rs 31,220 per 10 grams, respectively. It had gained Rs 625 on Thursday. Sovereigns held steady at Rs 25,100 per piece of eight grams in limited deals. In line with a general weak trend, silver ready declined by Rs 100 to Rs 51,800 per kg, while weekly-based delivery rose further by Rs 110 to Rs 51,650 per kg. The white metal had surged by Rs 1,745 in the previous session. However, silver coins continued to be asked around previous level of Rs 88,000 for buying and Rs 89,000 for selling of 100 pieces. SPECIAL: Why is a free market for gold risky and volatile? Gold smuggling is back with a bang!